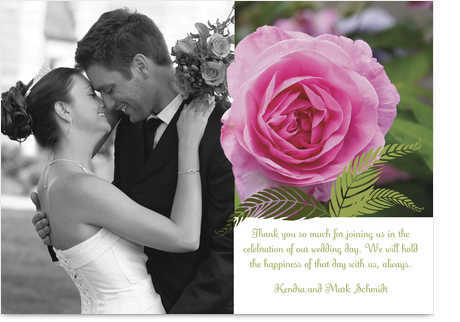 These sample wedding thank you notes are ones that I have written to help inspire your personalised thank you notes. Everything on this page is free for you to copy and use in your own personalised wedding thank you notes. I hope you'll find everything you need here right here! This section is growing very quickly with all the new ideas I'm adding and all the new visitor contributions! We are so thankful that you were able to come and celebrate our wedding day with us. Thank you for all of your support, love and assistance in helping to make our wedding day so special. We want to thank you for the very generous cheque you sent for a wedding gift. We are saving hard for the deposit on our first home and your gift will help us to reach our goal faster. We can't wait to invite you both for a visit as soon as we find somewhere. Our loving note can barely express how much you have added to our happiness today. Please accept our most sincere thanks for your wonderful gift and your much valued friendship. 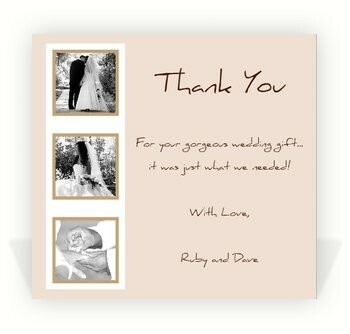 I love the wedding thank you cards at Planet-cards.com ... you can personalise them online and choose from a range of colours to match your wedding theme. Dear Clark and The Band. Thank you so much for playing at our wedding reception. You were really superb! Your choice of music for us was just perfect ... our guests have told us they thoroughly enjoyed themselves. Thank you again for the your huge contribution you made to our special day. A HUGE thank you to you for all of your help over the couple of months. Your service was outstanding, especially when we changed some of the hymns for our service at the last minute!! We received lots of compliments about our choice of stationery and have recommended your services to a number of our friends who are getting married next year. A verbal thank you alone, is never enough. Personalised wedding thank you notes for everyone who shared your day with you ... regardless of whether they gave you a gift! You'll find lots of advice about thank you note etiquette here to help.